This area was one of the places I wanted to visit the most in Japan. Not only Kamakura (鎌倉) is a small city full of temples and shrines so it’s sometimes called the Kyoto of Eastern Japan, but lot of anime series took place in the near vicinity of the city, esp. around Enoshima (江の島) - an island just off the coast connected by bridge with the mainland. The island offers a variety of attractions, including a shrine, park, observation tower and caves, sometimes when the visibility is good even view on Mt. Fuji. I was mostly visiting places, where Elfen Lied took place or Tari Tari. Where appropriate I’ll bring up Minami Kamakura High School Girls Cycling Club or Slam Dunk. There are probably many more places and shows which were inspired by them, but I cannot remember everything. It was afternoon, when we arrived to Kamakura, so exploring the city was left for the next day. That evening we just scouted little bit around our accommodation and visited Momiji Chaya - tearoom and restaurant. The dinner there was absolutely stunning. It was simple rice bowl with either tuna or salmon pieces on top of it and pickled vegetables or seaweed, but beautifully presented and delicious. What made it special was a pot with some kind of tea or broth, which was optional to pour over. It was recommended to first taste a little bit of the rice bowl separately, then little bit with the broth. Then it was up to you to decide which way you’d like to eat it and what texture was better for you. Next morning after breakfast we headed out to explore the places of Kamakura and Enoshima. First, we came to Kamakura station, where we bought our day tickets for the Enoshima Electric Railway or Enoden - single track train. The shot on the left is from the show Minami Kamakura High School Girl Cycling Club (episode 1, next time for short only Cycling Club) and the one on the right is from Tari Tari (episode 2). Whenever film or anime show features the areas around Kamakura or Enoshima, you’ll be able to find at least few shots with this Enoden train. We took the train to Hase station, where we wanted to see the Great Buddha of Kamakura (鎌倉大仏, Kamakura Daibutsu). It’s a bronze statue of Amida Buddha, which stands on the grounds of Kotoku-in Temple. With a height of 11.4 meters, it is the second tallest bronze seating Buddha statue in Japan, surpassed only by the statue in Nara’s Todaiji Temple (see part one of this series for more). I’d preferably take the picture from the front, but the amount of people there made it impossible, if I wanted it without them. The shot from Cycling Club is from the episode 9. From there we returned back to the Enoden and rode to Gokurakuji station. It’s surrounding is famous from few episodes of Elfen Lied - especially from the first episode. As we were there mid-September, we didn’t have the blooming Sakura trees, but otherwise it’s almost identical. In the second picture, the ramp for disabled people is missing in the screen from Elfen Lied and there is phone booth and mailbox is in different spot, but the show was aired 14 years ago - long time to change minor details around station. As you walk up the hill towards Seijyuin Temple, for short time you follow channel with floodgate. When you reach the top of the hill, the view it opens up is quite spectacular. You can see long staircase ending with smaller graveyard and in distance the ocean. Yuka says in the first episode of Elfen Lied, that Kouta liked watching the ocean from that spot and I’m not surprised. We made quick break at the temple, asked for another commemorative red stamp and then slowly started descent towards the graveyard, which was featured in Elfen Lied (episode 4) and in Cycling Club (episode 5). We circled the hill and returned somehow back to the Hase station, where we took the train again and finally arrived to Enoshima. The promo material of Tari Tari featured the Enoshima Station. 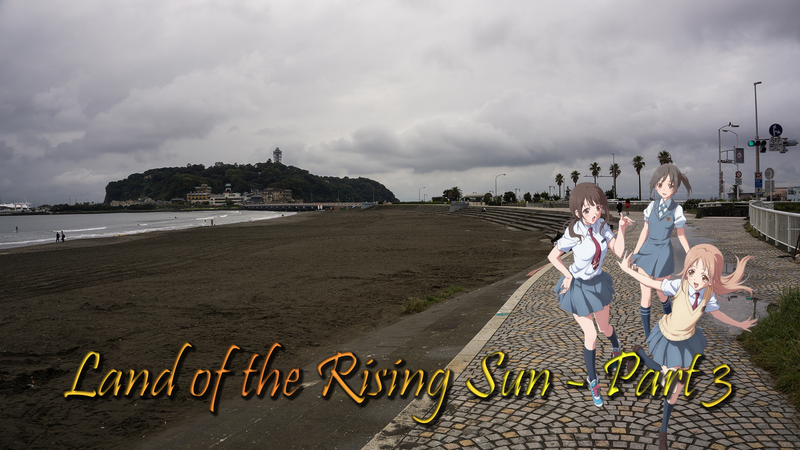 The other Tari Tari promo material features the beach and view of Enoshima island. On the left you can see shot from episode 9 of Cycling Club. What was interesting about the beach was, that hawks are there. You have to take care of your food while eating, otherwise they can attack you. One such attack happened right in front of our eyes, when somebody tried to eat their sandwich. The island itself is connected to the mainland with bridge. Same as Konatsu in the shot from Tari Tari (episode 5) we were happy to be finally there. Sadly, we didn’t have the same nice weather. After you cross the bridge, you start to climb to the Enoshima Shrine. Many gift shops and restaurants are along the way. Then huge red torii gate welcome you to the ground of the shrine. If you climb little bit more, you can enter the botanical garden and visit the Enoshima Sea Candle, also known as the Shonan Observatory Lighthouse. We decided not to, as the weather was not great and the visibility was low. On our way towards Iwaya Caves - two walkable caves we were able to see the rocky southern coast with pools of water (Tari Tari, episode 5). On our way back, I managed to snap a picture with the right fence as in Tari Tari’s first episode, but probably from the wrong place, as the view is not the same. Also - I was pretty disappointed as the really nice red bridge was only featured on the Blu-ray cover of Tari Tari, not in the show itself. Before wrapping up our eventful day and returning back to Kamakura, I still had one place I wanted to visit. It’s the most photographed place around there. The place is railroad (Enoden) crossing near the Kamakurakokomae station. It was featured in opening theme of Slam Dunk (a basketball show from 1993, based on the successful manga from 1990). This railroad crossing is so crowded, that they even have their own guard there to discipline people - they enter the road without realizing that it’s normal road and they can be hit by a car. The picture on the right is from the opposite side from the third episode of Tari Tari. When we returned back to our accommodation, we were again surprised how nice Japanese people are. The weekend we stayed in Kamakura was weekend of Yabusame Festival. It was invented in 12th century in Kamakura. A Yabusame course is 220 meters in length with 3 simple wooden targets placed at equal distances apart. The mounted archer starts at one end trying to hit all three targets. Our host house was on the main street just beside the Tsurugaoka Hachiman-gu Shrine, where this festival culminated. Being residents in that area brought benefit of getting passes for the special places, where normal tourists cannot go and they gave us the tickets. We could not be thankful enough. It was awesome experience.